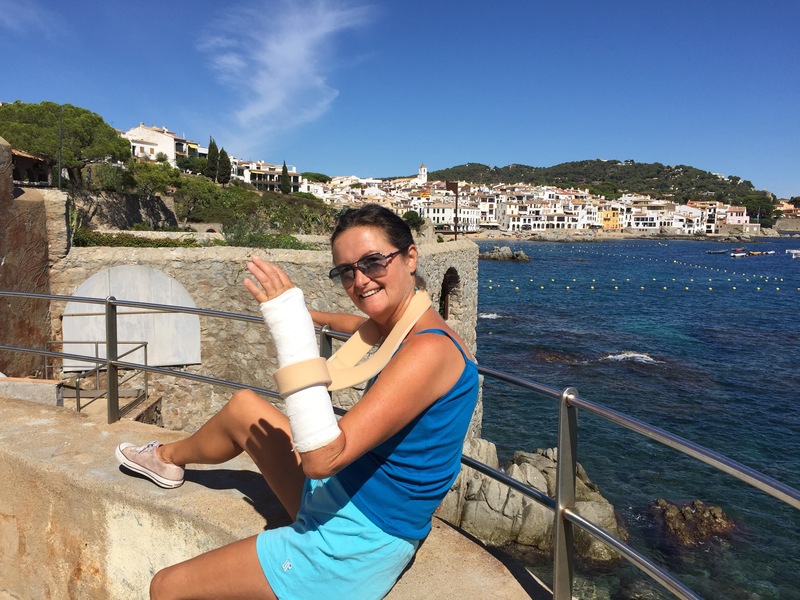 Thank you all for your kind wishes concerning Karens’s arm, that after a four hour stretch in the hospital on Tuesday we found had been fractured. She now is in a cast for 5-6 weeks, so David will have to up his game. A happy face by the beach. But Calella de Palaurugell has cheered her up no end, we have had a small series of minor disasters lately, more of them later but in the meantime a big thank you to you all. So sorry it’s that. Bad……..some excuse for not driving those narrow roads eh Karen? First of all the town itself is lovely. Do go visit. There is a daily market. There is a great restaurant (Commodore??) on the left as you go down the hill into Llafranch. Make sure you have a cremat. It won’t help the arm but it will take your mind off the pain. Love that area. Forget what I said about about the Commodore – the one I meant is called Leon’s. On your left as you go down the hill towards the beach from the main roundabout.